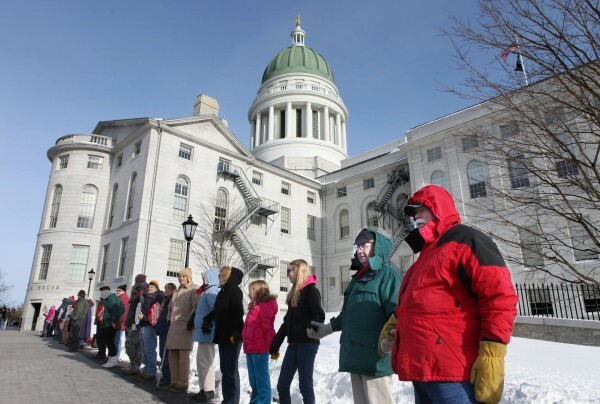 Hundreds of people join hands to form a human chain around the State House on Saturday afternoon during the annual Hands Around the Capitol rally that prompted weekend demonstrations in northern New England capitals. The event recognized the 37th anniversary of the U.S. Supreme Court's decision of Roe v. Wade that legalized abortion. Participants say they're now concerned about health care legislation that would include federal funds for abortion. 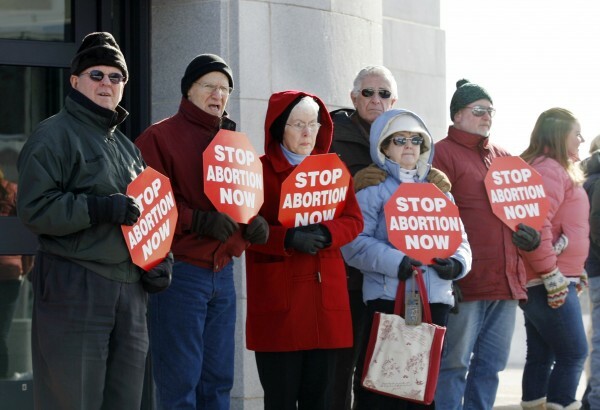 Participants in an annual anti-abortion rally gather outside of the state house Saturday, Jan. 15, 2011 in Augusta, Maine for the "Hands Around the Capitol" rally. The rally is held each year to recognize and mourn the anniversary of the Supreme Court's Roe vs. Wade decision. Participants in an annual anti-abortion rally march towards the state house Saturday, Jan. 15, 2011 in Augusta, Maine for the "Hands Around the Capitol" rally. The rally is held each year to recognize and mourn the anniversary of the Supreme Court's Roe vs. Wade decision. 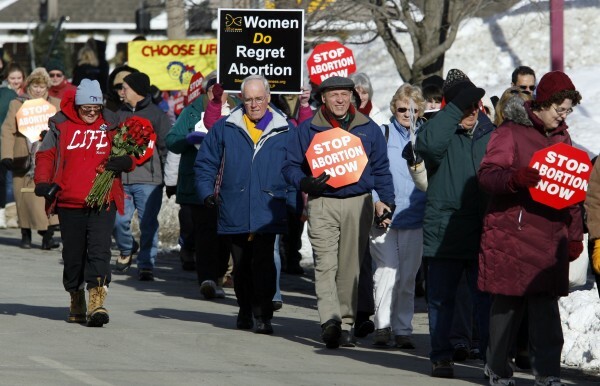 AUGUSTA, Maine — Hundreds of anti-abortion activists gathered in Augusta on Saturday to simultaneously mourn the 38th anniversary of the Roe v. Wade court decision legalizing abortion in the United States, and also to celebrate recent political changes that they believe bode well for their cause in Maine. In a clear reminder of the shifting political landscape, Republican Gov. Paul LePage attended part of the rally before the march. LePage, who says his views on abortion are shaped by his Catholicism, did not address the group but was greeted with a standing ovation from the crowd. “The governor is pro-life, and he wanted to show his support,” LePage spokesman Dan Demeritt said after the event. Defenders of abortion rights, meanwhile, also were gearing up for what is expected to be an active legislative session. “We are definitely seeing an increase in attempts to restrict access to comprehensive health care for women,” said Sarah Standiford, executive director of the Maine Women’s Lobby. Held annually, the rally and march to the State House organized by Maine Right to Life has grown into the largest gathering of anti-abortion activists in the state. The culmination of the event is the march and subsequent ceremony in which participants form a human chain — or most of one — around the State House as a bell is struck for each year that has passed since the U.S. Supreme Court legalized abortion in its landmark 1973 decision. On Saturday, more than 300 people braved temperatures in the teens with wind chills in the single digits to participate in the Hands Around the Capitol Memorial. During the rally held in the parish hall of St. Michael’s Catholic Church, speakers talked about the importance of reaching young people through the Internet and recent Gallup polls suggesting that opposition to abortion is growing fastest among 18- to 29-year-olds. “They are the ones who are going to change this nation and bring respect for human life back to our country,” said Sandy Faucher, president of The Rosetta Foundation whose organization runs an anti-abortion website targeting teens. But the buzz at Saturday’s events was Maine’s changed political dynamics. Maine voters not only elected LePage — a conservative Republican with strong anti-abortion views — to the Blaine House but also gave the GOP control of both chambers of the State House. It was clear Saturday that abortion foes hope to capitalize on the Republican victories. Emrich said he believes Maine is close to seeing passage of an “informed consent” law that will require women seeking an abortion to be given materials about alternatives, legal rights and other information. While Republicans do control both chambers of the Legislature, their numerical advantages are not large enough to guarantee success on particularly divisive issues such as abortion. Standiford of the Maine Women’s Lobby said the issues of abortion access and family planning have traditionally been handled in a bipartisan fashion. In fact, she pointed out that Republican legislators were instrumental in the formation of the Family Planning Association of Maine, an organization created in 1971 to prevent unintended pregnancies and provide health care access to Mainers. And while she is already aware of more than a half-dozen bills that have been introduced dealing with reproductive rights, Standiford said she believes most Maine voters and legislators continue to believe that family planning decisions are best handled privately between a woman and her doctor.